Consider the following conditions: You have been experiencing pain in your leg which tends to get worse when you sit, or you often experience a burning or a tingling sensation running down the leg or even a shooting pain that hinders you to stand up. Does any of these painful conditions ring a bell to you? If you have been experiencing one or more of the above-stated conditions, that it is time that you consult a certified chiropractor instead of opting for invasive or harmful treatments. Doctors of Chiropractic (DC) treat conditions like sciatica on a regular basis. An experienced and skilled chiropractor will always focus on finding the cause of the patient’s condition even before he or she starts an analysis. Getting to know the patient’s past medical history is very imperative in pursuance of deciding what kind of treatments should be given to the patient. Depending upon the severity of the patient’s condition, the chiropractors determine the type and intensity of treatment that should be given to the patient. Being one of the most effective and commonly used chiropractic treatment for sciatica, Ice Therapy is used to relieve the nerve inflammation, thus reducing your pain and even prevent sciatica from happening again. 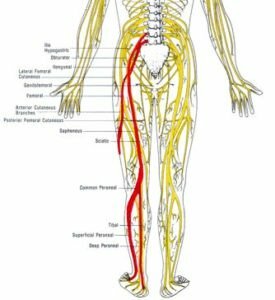 Having a very rapid response rate, this technique is beneficial for those patients who are experiencing excruciating pain. The Ultrasound method aids in reducing the excessive swelling, soreness, and also increases blood circulation by cutting out the pain while pressing hard on the sciatic nerve. The bodily tissues are infiltrated with the heat that is produced from the high-frequency sound waves. Electrical muscle stimulation is effective in helping relieving painful muscle spasms associated with irritation of the sciatic nerve. Relieving that pain around the irritated piriformis muscle is another effective method used by the chiropractor to relieve sciatic pain caused by the piriformis syndrome. The technique that is most widely used as one of the best chiropractic treatment for sciatica is the Spinal Manipulation. The spine is made up of vertebrae (connected bones), and if you happen to have a bad posture and weak abdominal muscles, then it can lead to slippage of vertebral discs by pressing on the nerves. With the aid of spinal manipulation, a chiropractor loosens the movement of your spine that is misaligned and restores them back to their original position. This procedure immensely helps you to minimize the inflammation, muscle spasms, and nerve irritability.